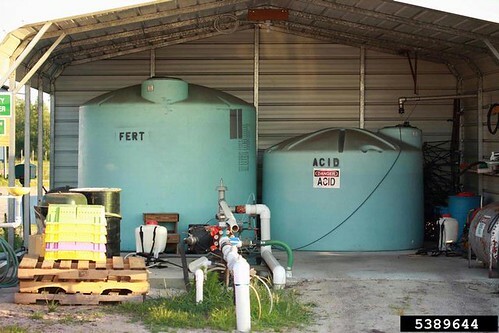 Fertilizer is more efficiently used. Fertilizer may be applied weekly in small amounts so that it is more available when the plant needs it. Application cost is considerably less. Nutrients more quickly reach the root zone in a soluble form. Nutrient application is more precise. Irregular growth and possible damage to plants if the irrigation system is not working properly. Specialized equipment must be added to the irrigation system. Soluble fertilizer is relatively more expensive than granular fertilizer. It is important the irrigation system functions properly and all plants receive the same amount of water. If water distribution is erratic, some plants may be under fertilized while other plants may receive more fertilizer than is needed. On sloping ground, the use of pressure compensating emitters is necessary to insure that plants in the low areas do not receive more water than those on the higher ground. Blueberries love low pH soils. the soil will stay around the pH of 5. Water pressure needs to be regulated so that it is within the boundaries of the emitters. The flow rate through the pressure regulators should be adequate to supply the area being irrigated. It is important to have a backflow value in the main irrigation line. This will prevent fertilizer solution from being sucked back into the well, community water system or other water source in the event of a power failure. Follow up with a proper and regular watering program after liquid fertilizer is applied. Proper irrigation will allow the fertilizer to stay in solution until the plant has taken it up. If the fertilizer solution dries in the soil, the fertilizer within the solution becomes more concentrated and can become toxic if additional water is not applied. Regular watering between fertilizer applications helps "wash" the solution deeper into the root zone and encourages a larger, deeper and healthier root system. Because liquid fertilizer is more efficiently placed and is more readily available throughout the growing season, it is easy to force more growth than is needed. Most fruit is born on the last 8 inches to 10 inches of the previous year’s growth. If more than 12 inches to 14 inches of growth is generated, the extra growth should be considered excessive. During the first four or five years, rapid growth is desired. However, if the plant grows too rapidly during the early years, it may become tall and leggy with only a small amount of fruiting wood. Some tipping of the upright branches may be necessary to produce the branching needed for maximum fruit production. Pruning should not be done after July 30 as fruiting buds are set on new growth produced in late summer. Liquid fertilizer should be applied to blueberries by incorporating it into the watering program once per week. Irrigation water should be allowed to run for one hour to fill the irrigation system and moisten the soil at the root zone. The recommended amount of fertilizer solution should then be introduced into the irrigation water for one or two hours and, then, fresh water applied for one hour. This method allows the system to fill with water and moisten the ground, allow the fertilizer to be applied, flush the system of salts and wash the nutrients into the root zone. An injector pump is the easiest and most reliable method for introducing fertilizer into the system. Most pumps will inject a certain amount of solution per hour. By knowing this ratio, it is easy to apply a recommended amount of fertilizer into the system. Fertilizer rates are based on the age of the plants. The accompanying chart indicates the total annual nitrogen recommended for blueberries in the first five years after establishment. The nitrogen rate is broken down into a weekly application rate, which will allow 25 applications beginning in early March and ending in late August. Fertilizer applications should be discontinued during harvest and resumed after harvest. Stopping the fertilization program in August will allow most of the fertilizer in the soil to be used by the plant before entering dormancy.